Five-song solo EP released on limited-run CD. Currently unavailable. Released on 2/26/11. 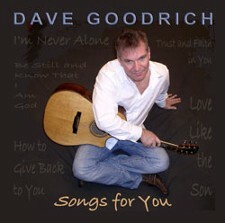 Five-song, spiritually-inspired album written, performed, produced, engineered, and mastered by Dave Goodrich in his private studio. Former Carbon Leaf bassist Jordan Medas performed on Tracks 1 and 4. Additional contributors on Track 4 include backing vocalist Cheryl Morey and keyboardist Angie Neely. The album cover design, graphics, and photography were done by Sandra Goodrich.